She wore one dress throughout her performance, and we loved it! From her Versace robe backstage (taking tips from J-Lo’s Dubai style?!) 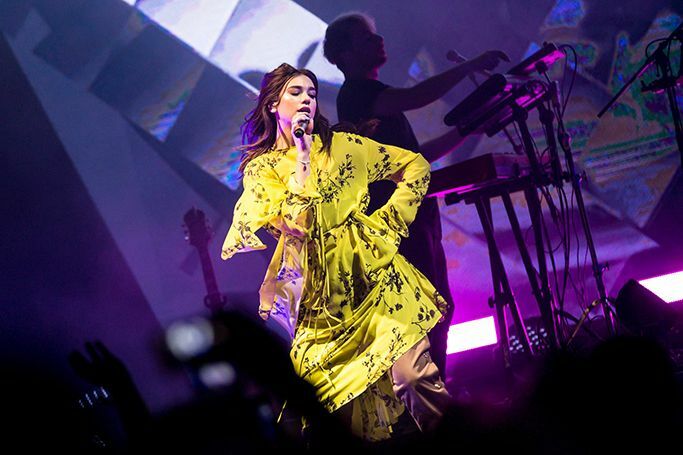 to her yellow kimono style dress with high platform white trainers, we have all you need to know about Dua Lipa’s fabulous fashion during her Abu Dhabi performance, as well as everything else the New Rules singer got up to whilst visiting the UAE. Last week Dua Lipa performed in the USA and won two Brit Awards in London, as the London born singer with Albanian parents is just 22 and already tipped for even more success in 2018 and beyond! Saturday night saw Dua Lipa’s first concert in the UAE, as fans from the region were impressed with Dua Lipa’s vocal ability, her quirky style and no dramatic wardrobe changes or over the top thrills, just pure entertainment. As Dua Lipa’s Self-Titled Tour was a massive hit in Abu Dhabi, the singer also had just enough time to explore the Sheikh Zayed Mosque and witness some of the treasures the Emirates has to offer! Back to Dua Lipa’s fashion picks in Abu Dhabi...the performer wore a yellow floral print dress with baggy trousers underneath and platform trainers which came straight from a ‘90s Spice Girls concert. Pre-performance Dua Lipa got ready in style for her big night on stage, lounging in a pale blue Versace robe with her initials embellished on it. As we loved Dua Lipa’s Abu Dhabi style! We don’t mind at all that Dua Lipa wore just one dress throughout her performance in Abu Dhabi, as fans were instead overwhelmed with her powerful voice and endearing nature which won over the arena. And, the hit-maker still looked stylish and chic, despite dancing and jumping throughout her show. We’re off to find a copycat version of Dua Lipa’s yellow floral dress, which will make the perfect spring wardrobe addition. As we can’t wait for Dua Lipa to return to the UAE…maybe a Dubai concert next time? !